It’s that time of the year again: we hurry busily through the shops and online stores looking for the perfect Christmas gift for the aunt who already has everything and for the parent or friend who doesn’t need anything. Don’t worry, because there are literally thousands of other people in the same situation, all in a hurry and nobody seeming to know what this perfect gift could be. In the hustle and bustle of holiday shopping, sometimes we forget that this time should be about the spirit of Christmas, about relaxing, spending time with family, and about love. 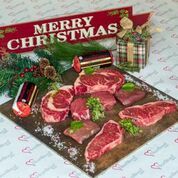 What better way to express the Christmas spirit of festivity and cheer than with a holiday gift package from HeartBrand Beef. HeartBrand Beef can be the common thread that brings together loved ones for one of the best holiday treats of all: sharing a meal. For many, those special meals are the unforgettable eating experiences that one never forgets. HeartBrand has a several cuts of beef from HeartBrand line that show your loved ones that you think they’re worth only the finest in holiday cuisine. Ask anyone who’s ever tried HeartBrand beef, and they’ll tell you the same: It’s the best beef you’ll ever eat! Hillary Voelker Kvamme is one of those satisfied customers. 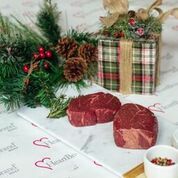 Stress no more and go to heartbrandbeef.com and order a holiday gift package or a gift card for the special someone’s in your life, and find some time to relax and enjoy the holiday season!